If living in a converted railway station wasn't unusual enough for you, here's an upcoming opportunity to move into an old Brussels church. The 71-metre-tall Eglise Saint-Hubert in Watermael-Boitsfort has just been sold to a property developer, which plans to turn it into 41 luxury apartments. A public inquiry into the planned development runs until 11 June. If approved by the local council at the end of June, it is reportedly the first time that a church in Belgium has been converted into housing - although smaller religious buildings including chapels have undergone similar projects in the past. Property firm Inside Development acquired the building for €1.5 million. "We chose this church because it has some essential qualities - it is large, bright and above all located in an attractive area, where we think we can find buyers interested in this kind of atypical property," said chief executive Carlos de Meester. Built between 1913 and 1931, the church had fallen into disrepair in the past decade. It was forced to close in 2010 due to falling stonework and the scope of the renovation was considered too expensive at almost €5 million. 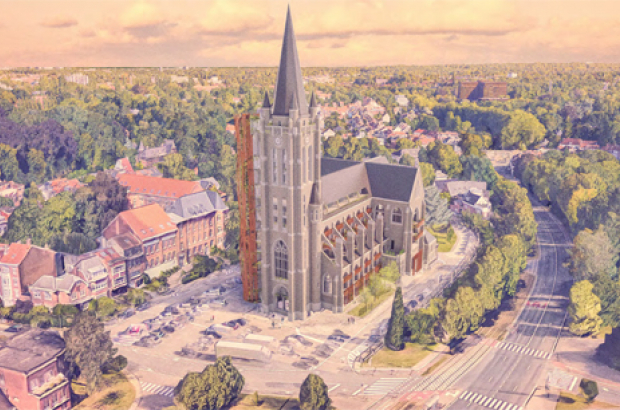 Watermael-Boitsfort councillor for housing, Benoit Thielemans, said the renovation costs amounted to three times the annual investment budget for the whole municipality and seeking a buyer for the church had become "inevitable". The archdiocese of Mechelen-Brussels did not oppose the conversion of the church into apartments - especially since a smaller, more manageable place of worship will be maintained on the ground floor of the new development.